The office is more than a place that employees go to earn a paycheck. Relationships between employees and employers are essential in creating an efficient and successful businesses. For these relationships to flourish and employers to successfully manage employees, there needs to be some degree of trust. 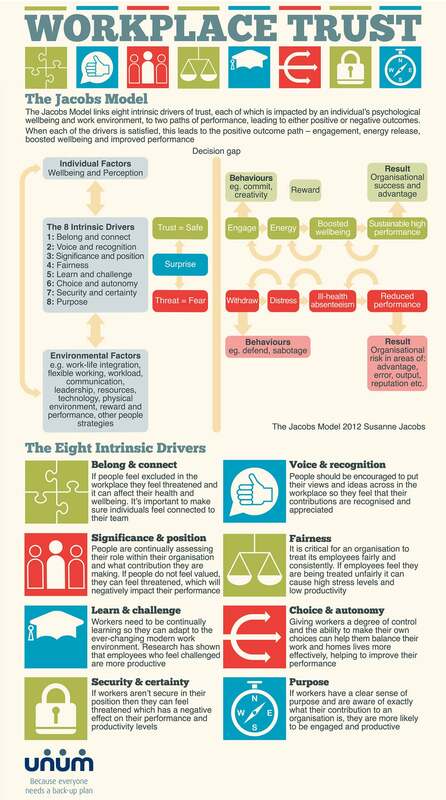 The Jacobs Model , outlined in an infographic by U.K. financial-protection insurer Unum, identifies eight drivers of trust that are necessary in the workplace. Find out what they are and how to use all eight to build workplace trust below.